Attending the coffee morning on Friday. Reading the issued booklet with gives information and advice on dyslexia and other specific learning difficulties. Accessing Dyslexia Scotland website where they will find a variety of resources as well as free Online Dyslexia Modules, offering a great CPD opportunity. If they have a desire to do anything with their class they will find additional activities at the bottom of the PHSE Lesson. Various video clips are also accessible on the server under staff share/public/dyslexia. General Dyslexia Quiz (Attached to email). Answers also attached. Video Clip – ‘Judged’ which can be accessed via staff share/public/dyslexia. Access Dyslexia Unwrapped https://unwrapped.dyslexiascotland.org.uk/ a website for children and young people with dyslexia aged 8-18. Direct the pupils to 13-17 years where they will find articles and information about living with dyslexia including; passing your driving test with dyslexia, mental health and self-esteem, studying and exams, a guide to my mysterious dyslexic quirks, what is it like with dyslexia. Individually or in pairs/groups read through the various topic areas. Read the messages from our ‘Young Ambassadors’ and watch the associated video clips unwrapped.dyslexiascotland.org.uk/info-and-support/young-ambassadors. If you cannot access the video clips they can be found in staff share/ public/ dyslexia/ambassador clips. This lesson can be done individually or as a whole class. Famous People Quiz (see attached). An additional information sheet is attached with quotes from the famous people which can be given out AFTER the quiz has been attempted. 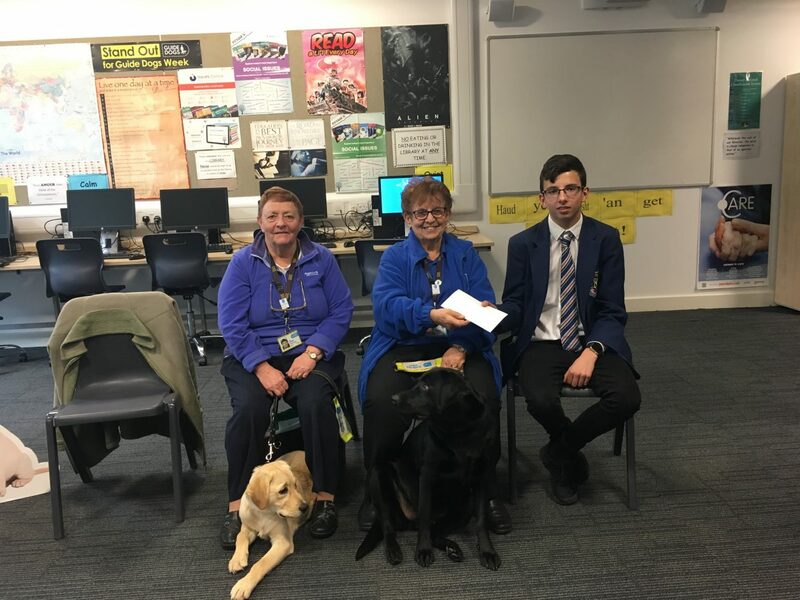 S3 ASDAN had a lovely visit from the Guidedogs today. The class have been busy fundraising for the organisation, so today Jack handed over a cheque to the lovely volunteers for the money raised. The class got the chance to meet two beautiful dogs. Get the student’s attention before you give out instructions. You could call their name or go closer to them, but also stay aware of any issues they may have with being in close proximity to others. Try using visual clues or symbols along with words as this may make your instructions easier to follow. People on the autism spectrum often find visual information extremely helpful. Give the child time to process information. Try using the six second rule: Count to six in your mind after giving an instruction. Make sure that you say what you mean. Avoid non-literal language such as metaphor, sarcasm and idioms without also giving a clear explanation of your meaning. You could spend some time teaching a student some common idioms and metaphors, explaining them in literal terms. They may like to compile a list of common terms they struggle with. Try to include demonstrations, activities and pictures in your lessons. People on the autism spectrum learn better when they see things. Use realistic pictures as they might not be able to relate to unrealistic ones. Visual supports are very helpful in preparing for changes and explaining information. Make the lesson more explicit by relating to the child’s experience. Or try to give the child such an experience – after all, it’s easier to understand happiness when you’re feeling it. The golden rule is to proceed from concrete (what the child knows) to abstract (what you are asking them to imagine). Try to teach a new topic in as many situations as possible. Children on the autism spectrum might find it difficult to ‘generalise’ a learnt skill or to apply a skill in a new way when in differing contexts. For example, if you are teaching addition, teach the child to add up using objects, numbers and finger counting. Don’t expect an autistic student to simply pick these things up, or to intuitively understand that horizontal and vertical additions are two ways of carrying out the same task. Keep things calm and simple. Autistic students will benefit from a quiet, distraction-free learning area. Because of their perceptual differences, too much noise, movement, bright colours and pictures will be difficult for most autistic students to cope with. Similarly if you are using pictures to teach, try to avoid complicated pictures or pictures with too much information. Have consistent classroom rules and routines. It’s important your autistic students understand what you expect of them. Make sure rules are explained explicitly using visual supports and that rules set are followed by staff (there is little more damaging to trust and rapport than staff not working by the rules that they set for others!). Have clear consequences for rule-breaking. These should apply to the whole class (and staff – see above). Having ‘time-out’ from a class can help a student recover from a stressful experience. Time-outs should be seen as meeting a need, not used as a reward for compliance or punishment. These help to provide structure and therefore reduce uncertainty and anxiety, helping the student to focus on their learning. To get more free teacher guidance about autism sent straight to your inbox, sign up to My World at www.autism.org.uk/myworld. 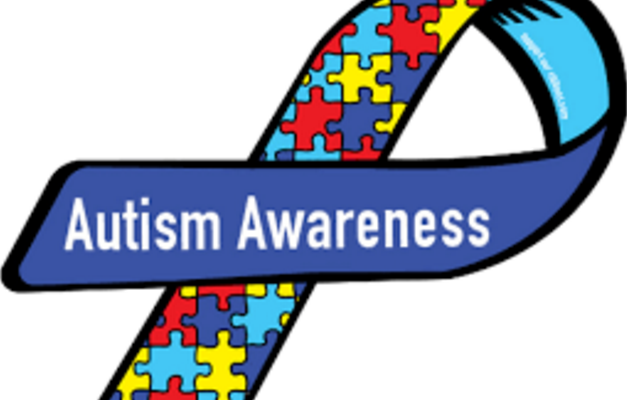 When planning your autism awareness activities, make sure you follow these guidelines. Always consider the possible sensitivities of any students who are on the autism spectrum in the class. A student who is on the autism spectrum may experience heightened feelings of anxiety and stress during the week. It’s important that their needs are being met. It could be that you make sure they have an area to escape to, to help them cope with any sensory issues or stressful situations. Some students may need to use noise-cancelling headphones, or a ‘stim toy’ to help them cope with an environment. Talk to them, and their parents/carers, about their needs. Autistic people of all ages are people first! Make sure you’re thinking about the individual person’s needs when preparing them for the week or any activities. Avoid making assumptions about how they will find something. Talking about autism will draw a lot of focus to any student who other students know is autistic. Make sure the pupil does not feel singled out. The added focus could lead to bullying, so put measures in place to prevent this. ***speak to the student throughout the week to find out how they are coping – if speech is an issue then using talking mats (mats to which pictures can be attached and re-arranged as required) are a good way to find out when a student is feeling happy or sad during the school day. We recommend you speak to the parents or carers of your autistic students about what will be covered before the activities begin. This will give them a chance to talk through any worries and concerns that the pupil may have. We also recommend the teacher has a conversation with any autistic students before the lessons begin to further prepare them. It’s important that autistic students feel in control of the situation as much as possible. This might mean working with you to create coping strategies for overwhelming situations, and taking an active role in planning the activities with you. Support for Learning are hosting a coffee morning on Friday 27th April to both raise awareness and raise money for Scottish Autism society. This module aims to give a better understanding of autistic female characteristics and provide you with the skills and knowledge to be aware of more subtle characteristics. Dyslexia Scotland are offering a fantastic CPD opportunity free of charge. They have created 3 online modules to raise awareness and develop your knowledge of dyslexia. The modules, which support GTC Scotland Professional Standards, Professional Update and Professional Recognition, have been developed primarily for teachers, school management and GTCS registered local authority education officers. Please take a look via our link. Welcome to Dyslexia Unwrapped, the online hub for young people with dyslexia. It’s fun, informative and designed just for you. Watch a vid, find support, get involved via our Dyslexia Links. 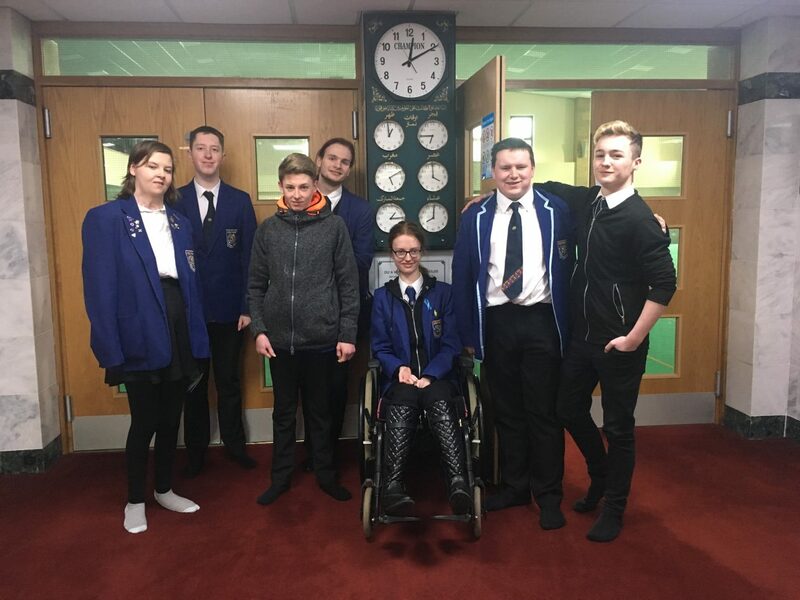 S5/S6 ASDAN class had a great morning visiting Bellshill Mosque. They are working on a unit looking at different religions and all the class found the visit thoroughly enjoyable and informative. These sites are outwith the control of the school and their contents may change without notice.